Are you looking to increase your results with the 17 Day Diet and wonder if incorporating weight loss exercise at home into your routine will do the trick? Disclosure: I received a complimentary premium membership to Fit2B so I could poke around and make sure the exercise videos were up to par for you! And guess what? They are! There are affiliate links in on this page, and if you click and happen to purchase, I may receive a small commission at no extra charge to you. I only recommend products that I either use or feel would be helpful to you. We all know that diet is probably 75 to 80% responsible for your weight loss results. However, if you're looking to tone up, increase your fat and caloric burn, or want to break through that pesky plateau, there are weight loss exercise workout videos you can use at home to get the job done. All in less time than it takes to drive to and from the gym! Once upon you could purchase the official 17 Day Diet workout DVDs on Amazon. Unfortunately, that hasn't been an option for a very long time as they're no longer produced. Over the years community members asked me about 17 Day Diet workout videos and specific workout plans to help them lose weight. I'm not a certified instructor or experienced in fitness, so I didn't have a lot to give when asked. Plus, I didn't know a fitness professional that I could fully trust for recommendations....until now. I'm not a fitness expert so I'm bringing one to you! Meet your new fitness instructor, Beth Learn, from Fit2B Studio. 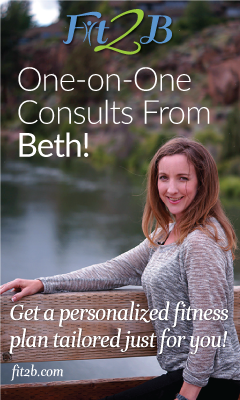 Beth has decades of experience specializing in tummy-safe exercises for ladies (and men, too!). Read more about Beth and her credentials. Learn about Fit2B's membership options. Walking Workout (easy): Use this routine to get some additional upper body work done while you walk in place, on a treadmill or outside! 21 Toneup (moderate): This is a fun cardio routine that provides 21 different arm motions layered over a repeating set of 7 different leg motions for a combined total of 21 minutes of constant heart-raising total-body motions that will get your whole self going! Totally Transverse (easy): Skip the crunches, and go deeper to the core muscle that forms your god-given girdle. If your “transverse abdominus” isn’t tight and toned, those love handles will get out of control! Fit2B has given me access to their premium membership so I could check out their library to make sure the workouts are up to par for the 17 Day Diet. And guess what? They are! There's a workout for every fitness level+ everything is organized and can be easily filtered so you can find exactly what you need. Tell Me More About the Fit2B Workouts for Weight Loss & More!